We were so thrilled to receive a wonderful letter from Buckingham Palace thanking us for the card which the children made the Queen for her 90th birthday. The children at our Chippenham and Cheltenham nurseries made two beautiful cards which we sent off just before the Queen’s birthday in April. 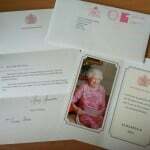 The letter was a wonderful surprise and we feel very proud to have received such honoured correspondence! Well done to all of our fantastic children and staff.